In just a few short weeks (November 1-5) Maryland International raceway will host the Wiseco-sponsored, Haltech World Cup Finals, an event that pits some of the fastest import cars in the world against their domestic counterparts. English Racing’s Wiseco-sponsored EVO X will be there to go to battle on the global stage. The engine powering the car is a 2.0L with Wiseco pistons, GRP aluminum rods, a 4 Pistons Racing–CNC-prepped cylinder head and over 60psi of boost, force-fed by a Precision Turbo. English Racing will team up with the ETS GTR for the Haltech World Cup Finals, where they will face off against some of the toughest competition in the country. Click Here for more info on English Racing's EVO. 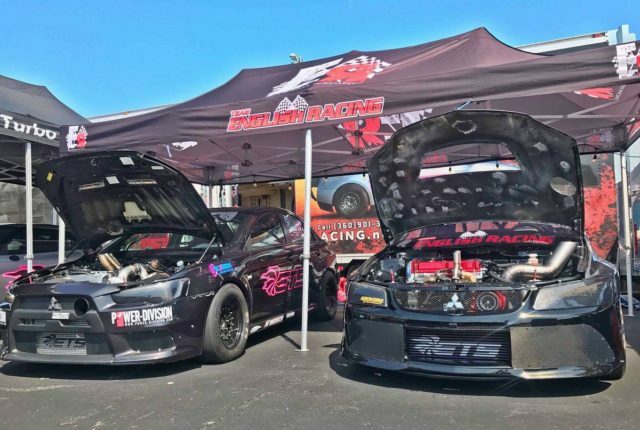 The 4B11TE engine in English Racing's EVO X is built to the hilt with a huge turbo, forged, Wiseco pistons, and a precision turbo cranking out epic boost. Check out the full story on Dragzine for English Racing’s attack strategy and how they’ll be assisting the record-holding ETS GTR in its goal to, once again, rewrite the record books. English Racing owner, Lucas English, reviews the data from a run. We hear he will be the hot shoe behind the wheel of the ETS GT-R as well.